"RV" redirects here. For research vessels, see R/V. For other uses, see RV (disambiguation). RVs can either be trailers (which are towed behind motor vehicles) or self-motorized. 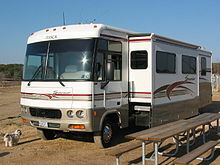 Most RVs are single-deck; however, double-deck RVs also exist. To allow a more compact size while in transit, larger RVs often have expandable sides, called slide-outs, or canopies. An early type of caravan is the horse-drawn covered wagon, which from circa 1745 played a significant part in opening up of the interior of the North American continent to white settlement. By the 1920s the RV was well established in the United States, with RV camping clubs established across the country, despite the unpaved roads and limited camping facilities. Several companies began manufacturing house trailers (called trailer coaches at the time). Airstream is one such company. 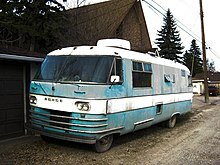 Until the 1950s, the RV industry was closely connected to the mobile home industry because most mobile homes were shorter than 9 metres (30 ft) long, and thus easily transportable. During the 1950s, the RV and mobile home industries became separated and RV manufacturers began building self-contained motorhomes. In Europe, wagons built for accommodation (rather than just transporting people or goods) were developed in France around 1810. They were used in Britain by showmen and circus performers from the 1820s. Romani people only began living in caravans (vardos) circa 1850. In Canada, the earliest motorhomes were built on car or truck bodies from about 1910. In Australia, the earliest known motorhome was built in 1929. This motorhome is recognized as being the first motorized caravan in Australia and is currently located in the Goolwa museum. Although the most common usage of RVs is as temporary accommodation when traveling, some people use an RV as their main residence. In the United States and Canada, travelling south each winter to a warmer climate is referred to as snowbirding. In Australia, the slang term for a retired person who travels in a recreational vehicle is a "grey nomad". Some owners fit solar panels to the roof of their RV. Usage of RVs is common at rural festivals such as Burning Man. As of 2016, the average age of a person owning a recreational vehicle in the United States was 45, with a three year decrease since 2015. ^ "What is a Recreation Vehicle (RV)?". www.rvia.org. Retrieved 4 March 2018. ^ "Recreational Vehicle". www.fema.gov. Retrieved 4 March 2018. ^ "Mike Rosman RV :: RV's Then and Now". www.rosmanrv.com. 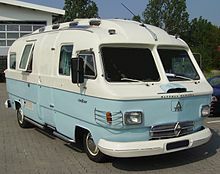 ^ "The brief history of RVs in America and the world". WM-AW based upon RV/MH Heritage Foundation. Retrieved 10 June 2017. ^ "History of the Vardo (Gypsy Caravan)". ValleyStream Media. 2009. Retrieved 23 July 2013. ^ "From Past to Present 1901–1910". RVHotlineCanada.com. 2003. ^ "Pop Kaesler's Motorhome". Campervan and Motorhome Club of Australia. Retrieved 10 June 2017. ^ Ben Wittbrodt, John Laureto, Brennan Tymrak and Joshua M Pearce. Distributed manufacturing with 3-D printing: a case study of recreational vehicle solar photovoltaic mounting systems. Journal of Frugal Innovation 1(1), 1-7 (2015). ^ "RVs". Retrieved 6 November 2014. ^ Schultz, E.J. (19 March 2018). "Young Wanderlust Gives New Life To RV Market". Advertising Age. Retrieved 20 March 2018. Wikimedia Commons has media related to Recreational vehicles. Gallant, JD (2005). How to Select, Inspect, and Buy an RV. RV Consumer Group. ISBN 1890049-9-05. Freeman, Jayne (2005). The Complete RV Handbook. McGraw-Hill Professional. ISBN 978-0-07-144339-5. Moeller, Bill (2007). The Complete Book of Boondock RVing: Camping Off the Beaten Path. McGraw-Hill Professional. ISBN 978-0-07-149065-8. "Hitting the Trail 1935 Style". Popular Mechanics: 40–42. July 1935.